Image caption The monitor was pioneered at University College Hospital, London. The NHS could save £400m a year if a blood flow monitor was used more during surgery, the health watchdog says. In its guidance for England, NICE says the device, which was developed in Britain and uses ultrasound, reduces complications and speeds up recovery. It says the CardioQ-ODM cuts the length of time patients spend in hospital following major or high-risk surgery by an average of two days. Use of the device saves £1,000 each time, the watchdog adds. At present, fewer than three in 100 eligible patients are monitored using it, but NICE estimates if that figure was increased to 50 in 100 patients, it would save the NHS in England more than £400m a year. In a cash-strapped health service it is worrying that the NHS is taking so long to adopt good ideas. Professor Monty Mythen said it was partly down to what he called "silo-budgeting". He said: "The cost of the probe - about £100 a time - comes out of the anaesthetics budget. "That is a big extra cost. It saves £1,000 in the weeks to come but that saving goes to the surgical budget." NICE suggests that more than 800,000 patients a year in England could benefit from being monitored using the ultrasound device. At present fewer than 25,000 patients are monitored using it. 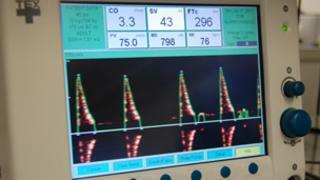 Based on the same principle as a police speed gun, the monitor uses ultrasound to measure the rate of blood flow from the heart. The device, which has an ultrasound probe at its tip, is inserted into the oesophagus or gullet. The signal is reflected by blood cells travelling down the aorta, which enables doctors to establish how much oxygen and nutrients are being sent to vital organs. The monitor was pioneered at University College Hospital in London. Monty Mythen, professor of anaesthesia at the university said: "The main benefit is it allows us to adjust the amount of fluid and blood we give to the patient to maintain optimum flow during surgery. "This helps prevents complications in the post-operative period and means patients feel well more quickly." Because the probe is inserted into the gullet, it also reduces the risk of infection that comes with monitoring using a tube inserted through a vein into the heart. "The great thing about this is everybody wins," said the chief executive of NICE, Sir Andrew Dillon. "There are fewer complications for patients post-operatively, they spend less time in hospital and the NHS can save money. It's a much more efficient way of undertaking this kind of surgery." This is not new technology - proDeltex Medical, based in Chichester, West Sussex, has been producing the monitor for around 20 years. But its chief executive, Ewan Phillips, is hopeful NICE's backing will lead to a huge increase in orders at home and overseas. "It takes a long time for ideas from the clinicians to feed through to the senior management - the sort of people who can make decisions to do things on a wide scale. That's always been a problem in the NHS," he said. NICE's guidance applies to England, but it hopes hospitals around the UK will begin to use the heart monitor more frequently as a means of benefiting patients and cash-limited budgets. "This innovation does not just mean savings for the NHS, but more importantly, better outcomes for patients - which is at the core of our plans to modernise the NHS. "A speedier uptake of effective innovations will help drive improvements in the quality of care for patients."